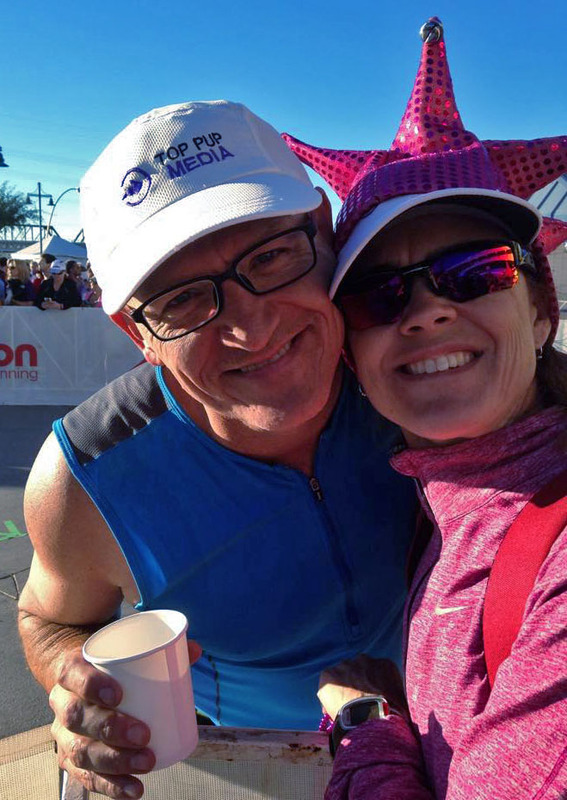 This past Sunday, I got to hear those words, “Russ Pond, you are an Ironman!” My one-year journey to finish a full Ironman had come to an end. And what an amazing journey! I wanted to take some time to document the experience. Now that a few days have past (and the soreness is starting to alleviate), it is fun to look back on that very long but special day. We arrived in Tempe the Thursday before the race. I wanted to have a few days to acclimate to the dry, Arizona climate. I was also able to register and pick up all my race material, including my race bib. It was starting to get very real. My coach also had me start a regimented hydration plan to make sure I was ready for race day: 80 ounces of Gatorade and 20 ounces of water every day. There were a few times I crashed or bonked on my long training days, and it was because of dehydration. So, I had to take special care to make sure I was very hydrated for race. 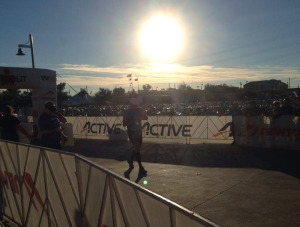 And with the drier air and less humidity in Arizona, hydration was extremely important for race day. On Friday, our friends Heather and Monica arrived, and we picked them up at the airport. 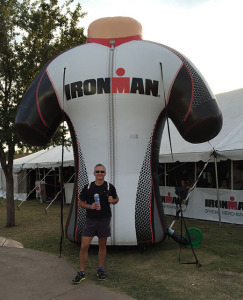 We spent some time at Ironman village seeing the sights and experiencing the race weekend festivities. Afterwards, we drove the bike course. This really helped me see what I would be facing on race day. On Saturday, the day before the race, I had to make sure everything was prepared. 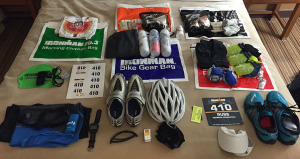 I laid out all my gear, race attire, nutrition, everything I needed for the race on Sunday. And, it was a lot of stuff! The green morning bag for clothes and anything you needed to leave behind before the swim. The blue bike gear bag for your helmet, shoes, nutrition, etc. The orange bag for your bike special needs halfway through the ride. The red run gear bag for your shoes, hat, socks, more nutrition, etc. And, the black run special need back for the halfway point. After I had all my gear bagged up and ready to go, I had to check in my bike, my bike bag and my run bag on Saturday. Surprisingly, I slept like a baby the night before the race. Most of the time, I toss and turn before a race, but for some reason, I slept about 7 hours. I think it was because I had resolved in my mind that no amount of worry, concern, fretting, fear or doubt could help me on race day, so why bother. I had no lofty goals of finishing fast or under a certain time. I just wanted to finish, and finish uninjured. We were up at 4am for my normal routine of coffee and oatmeal. And at 5am, we headed out to the race venue. That morning, I kept telling myself, “This day will come and go. 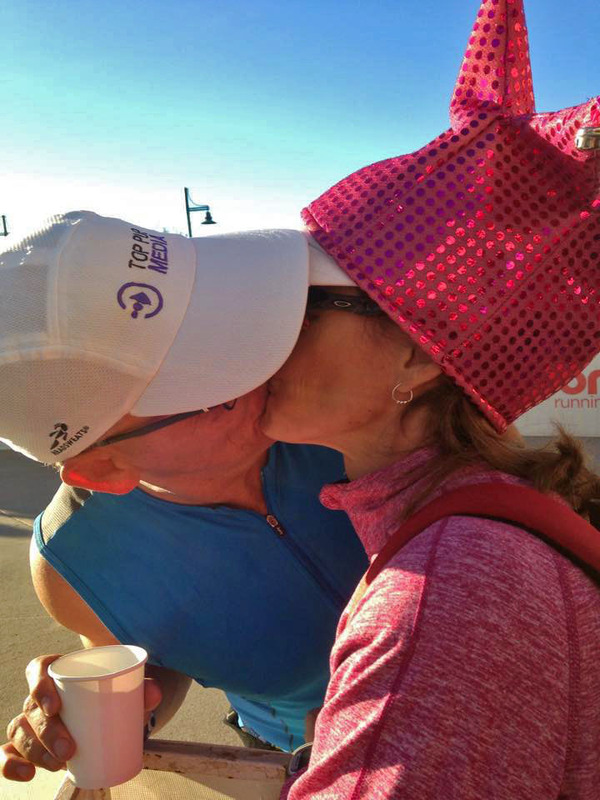 Enjoy each and every moment as best you can.” Even now as I write this, the race day experience is starting to fade. 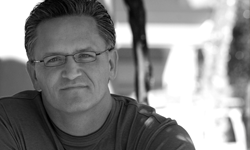 But, I’m convinced that my attitude to “experience the moment” made a huge difference! As I donned my wetsuit, swim cap and goggles, the sun was just starting to come up. The pros started at 6:45, and the rest of us started at 7am. The start line was about 200 meters from where we got in. 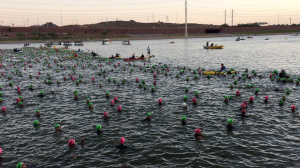 We had to swim up to the start line, and then tread water for about 15 minutes. Initially, I was a bit concerned about that, but I really liked it. The short swim was an excellent warm up. And then, staying in the water an extra 10 or 15 minutes was an excellent way to get adjusted to the water temperature, since it was a chilly 68 degrees. My coach told me to get the front so that I wouldn’t have to fight through the slower swimmers. And, to the front I got! To the very front. It was a great position for the start of the race. The canon went off and we started swimming. It quickly turned into a giant washing machine. It is very common to bump into others on the swim. I got hit and kicked a few times, but nothing too serious. I used my arms to pull myself through the water, but at times, I used my arms to block feet from kicking me. I immediately swam to the center of the lake so I could hug the buoys. 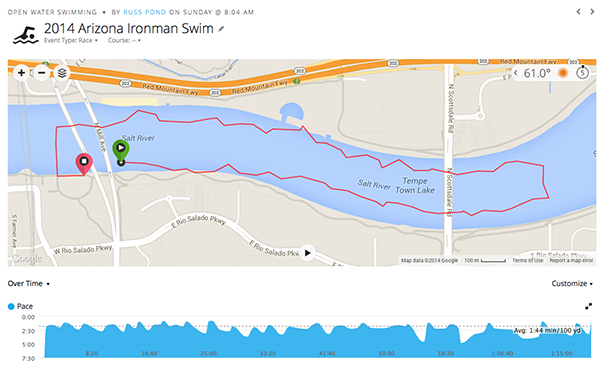 I knew that my swim would be a short, one-hour warm up for a very long day, so I paced myself slower than usual. In training, I had swam this distance faster, but I knew that this event made up less than 10% of my day, so I didn’t want to burn a lot of energy trying to crush the swim. I was ready for the bike portion of the race. I felt very confident about the swim and the bike events, because I knew I could finish them pretty quickly. Boy, was I wrong. The bike ride was brutal! 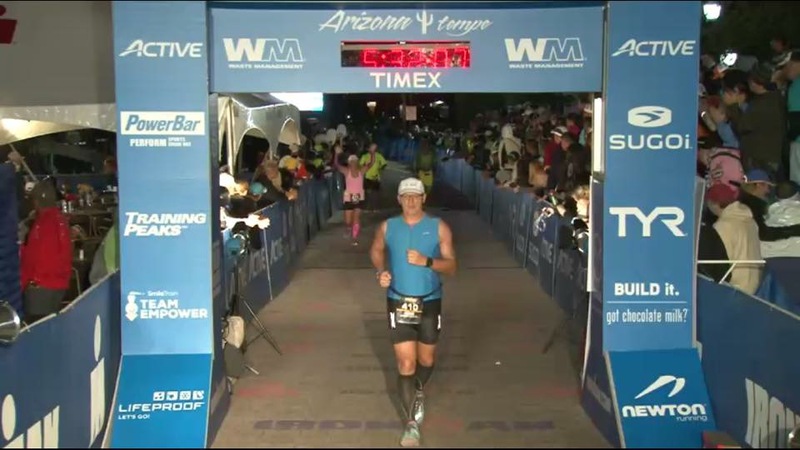 I read later that it was the worst wind conditions in the 11 year history of the Arizona Ironman. Winds were 20 to 25 mph with gusts up even higher. The bike course was three, out-and-back loops. Going out was uphill and into the wind. It was painfully hard. I was only averaging about 11 to 12 mph going out, but about 25 mph coming back. It was exhausting. Add to that some dust storms, tumbleweeds, stray dogs and some dead snakes on the road. Originally, I thought I could average about 16.5 to 17 mph for the entire bike ride, but only ended up averaging about 14.5 mph. I was hoping to finish the 112 miles in about 6:30 to 6:45, but the bike ride took me 7 hours and 43 minutes. I was exhausted. A few folks had warned me that once I got off the bike, the thought of running a marathon would be overwhelming. But, my experience was quite different. I went right into the run feeling pretty good and strong. Probably because I was so happy to get off the bike and start moving in a different motion. But, the run did concern me the most. I had never run a marathon before. And, it’s my weakest of my three events. Add to that an ankle surgery and a couple knee surgeries. And, now that I was about an hour longer on the bike, I had to push the run a bit harder than expected to finish before the race cut off time of midnight. 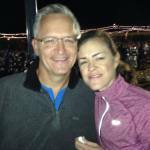 Using a 5:1 Galloway method, I started my run/walk. And surprisingly, I felt really good. 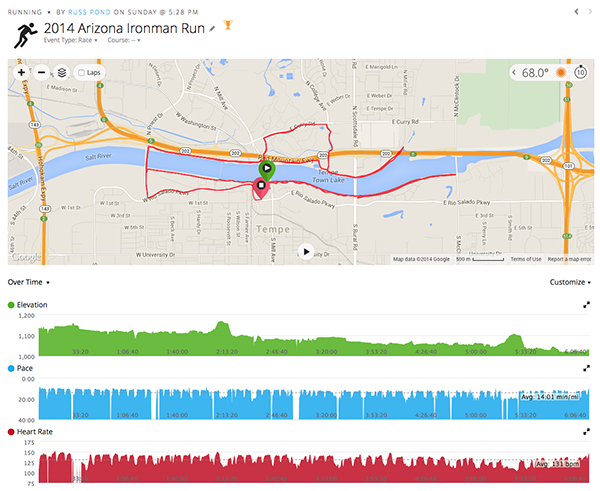 I ran the first half of the marathon only 7 minutes slower than my half Ironman pace two years prior. That really surprised me. But, the second loop got really hard, really fast. 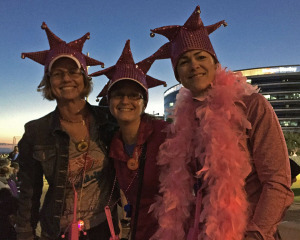 Thankfully, Angela, Heather and Monica were there to cheer me on. They were able to see me quite a bit on the run which helped a lot. On the second 13.1 mile lap, everything started to hurt. My quads and my feet were the worst. I had switched my run/walk ratio to 3:1 (run 3 minutes then walk 1 minute). Every time my Garmin buzzed the reminder “Walk 1 Minute”, I was so happy. Yeah, rest! But, those 60 seconds always seemed to fly by. The next buzz to “Run 3 Minutes” was not so welcomed. But, I would slowly start running again. Thankfully, my heart rate stayed at a good level. My goal was to keep it below my lactate threshold of 165 bpm. By keeping it below that threshold, my body was able to flush out most of the lactic acid. So, by keeping my heart rate below that, I would be less sore the next day. I saw Angela, Monica and Heather around mile 23. It was the last time I would see them until the finish. And that 23 mile marker looked great! Angela said, “Only 3 miles left. That’s just a run around the neighborhood.” True. I could this. Each of those final mile markers were so sweet. Mile 24. Ah, only 2 miles to go. Mile 25. Yes, nearing the end. Then, the final turn into the finish line! I really surprised myself by finishing my first ever marathon distance at 6 hours and 7 minutes. It was nice to run through that big blue finishing arch and here your name being called out. My two favorite moments when doing a triathlon are starting and finishing. This was a big finish, a year-long finish, a dream-fulfilled finish. I quickly found Angela, and warmed up in the medical tent with some blankets and chicken broth. After picking up the gear bags, we headed back to the hotel for some more food. And sleep. My quest for 140.6 had been completed. I did the training. I overcame the mental struggles, and finished the race. It’s a good feeling. 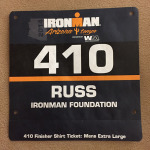 The thought of doing an Ironman scared me. My approach to fear is this — if it scares me, then I have to do it. Do it afraid. Throughout my training, there were constant fears and doubts all along the way. (Just ask my wife.) I think too many people let these crippling thoughts keep them from achieving great things. Everyone of us has so much potential, and yet we mentally limit ourselves before even one step is taken. Or, even as we start talking those steps, we stumble or stub our toe, and quit. Instead, we should regroup, learn from the stumble and keep walking. With anything in life, it takes hard work. Any mountain that stands in your way can be conquered. But, it starts with one step. 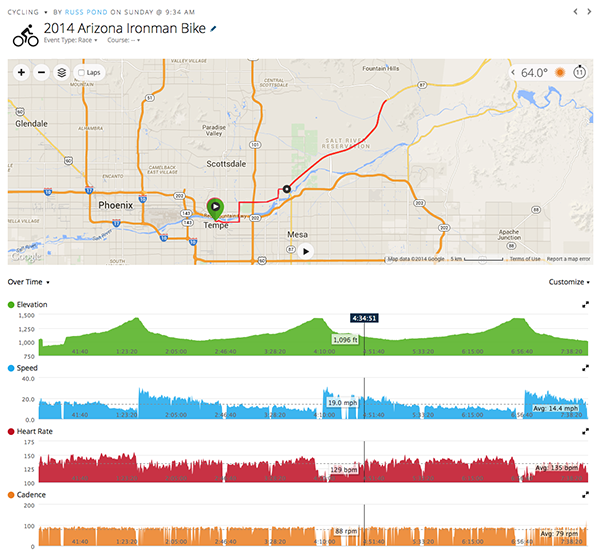 When I started training seriously six months before the race, I had never biked more than 56 miles. I had never run more than 13.1 miles. I had never swam 2.4 miles. All of those distances were new to me. But, my coach built a plan specifically for me, and stuck to the training. I made weekly increments and progress during those six months. 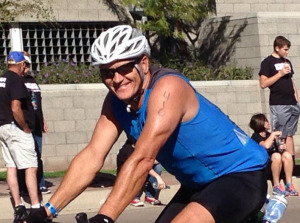 Three weeks prior to the race, I now had biked 100 miles, run 15 miles and swam 2.4 miles in training. And, I felt good doing those distances. I found that when I worked the training, the training worked me. This is true with everything in life. Don’t expect to go do an Ironman without any training. And don’t expect to make a movie, write a book, start a business, whatever you want to do without training and increment steps. It starts with one step.